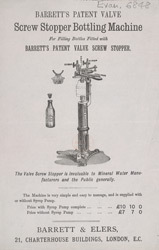 This is an advertisement for Barrett and Elers screw stopper bottling machine. By the middle of the 19th century glass was one of the most popular materials for holding liquids. Glass was strong as well as cheep and easy to make. The demand for glass bottles in this period was enormous because carbonated drinks like lemonade or light beer, that were sealed in these bottles stayed fresh for long periods. Screw top bottles were introduced in 1858.